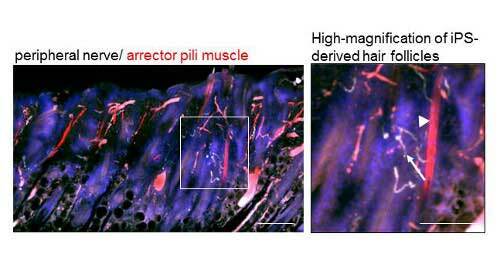 (Nanowerk News) Using reprogrammed iPS cells, scientists from the RIKEN Center for Developmental Biology (CDB) in Japan have, along with collaborators from Tokyo University of Science and other Japanese institutions, successfully grown complex skin tissue—complete with hair follicles and sebaceous glands—in the laboratory. They were then able to implant these three-dimensional tissues into living mice, and the tissues formed proper connections with other organ systems such as nerves and muscle fibers. This work opens a path to creating functional skin transplants for burn and other patients who require new skin. 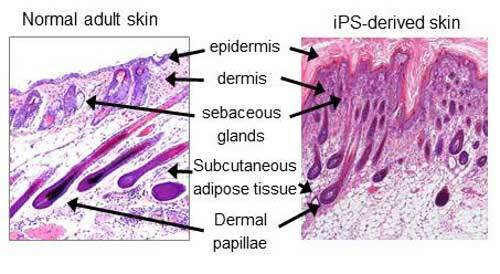 Comparison of natural and iPS-derived tissue. To perform the work, published in Science Advances ("Bioengineering a 3D integumentary organ system from iPS cells using an in vivo transplantation model"), the researchers took cells from mouse gums and used chemicals to transform them into stem cell-like iPS cells. In culture, the cells properly developed into what is called an embryoid body (EB)?a three-dimensional clump of cells that partially resembles the developing embryo in an actual body. The researchers created EBs from iPS cells using Wnt10b signaling and then implanted multiple EBs into immune-deficient mice, where they gradually changed into differentiated tissue, following the pattern of an actual embryo. Once the tissue had differentiated, the scientists transplanted them out of those mice and into the skin tissue of other mice, where the tissues developed normally as integumentary tissue?the tissue between the outer and inner skin that is responsible for much of the function of the skin in terms of hair shaft eruption and fat excretion. Critically, they also found that the implanted tissues made normal connections with the surrounding nerve and muscle tissues, allowing it to function normally. Connections between bioengineered tissue and natural tissue.